Today was another very short day. 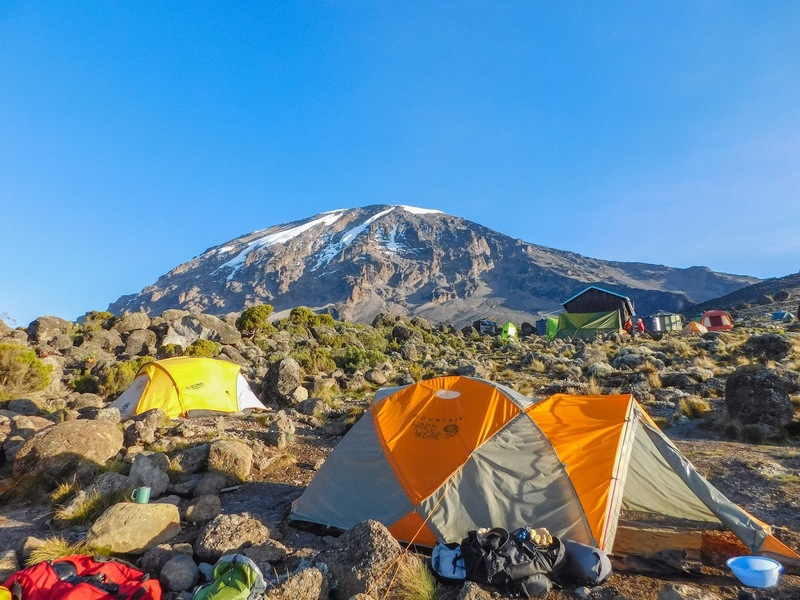 We got an early start from camp around 8:30am and began heading up towards our summit Basecamp at Barafu where we would eat lunch. 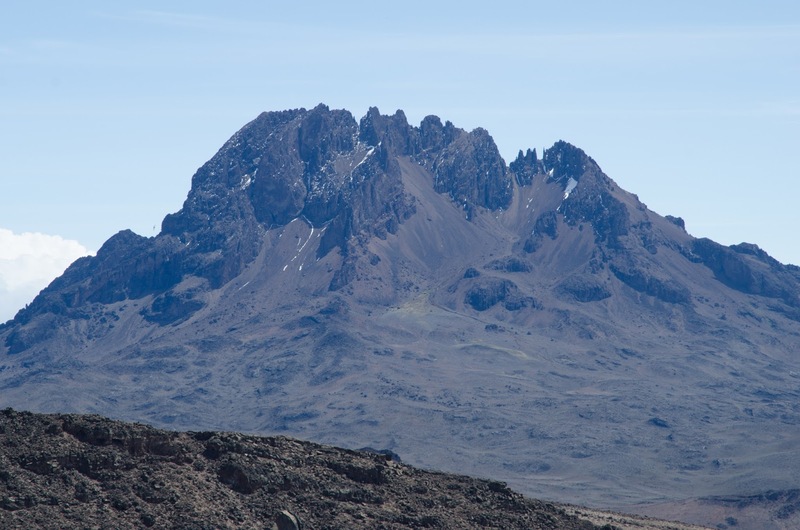 All morning we were hiking under the hulking mass of the Uhuru Peak above us with glaciers spilling down its sides towards us. 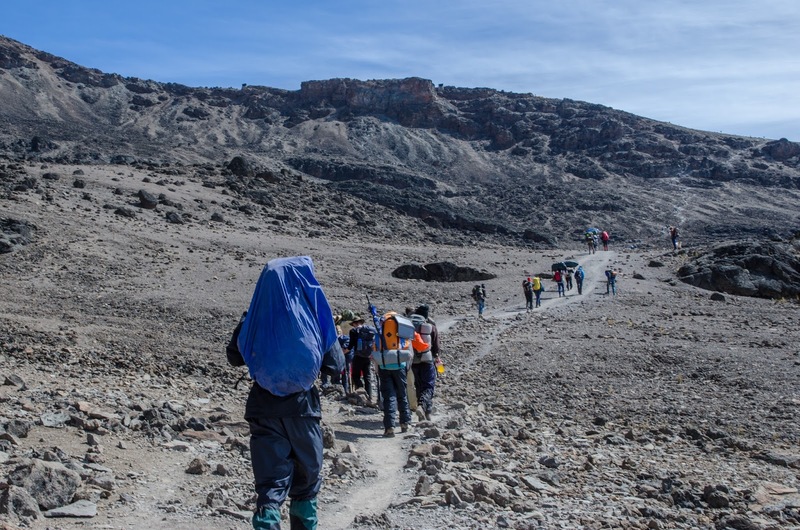 We were definitely now in the alpine zone of Kilimanjaro with nothing but bare rock around us as we traversed the landscape towards our final camp. We passed a really neat area of tiny cairns around 3-4 feet in height where we stopped to rest and take photos. 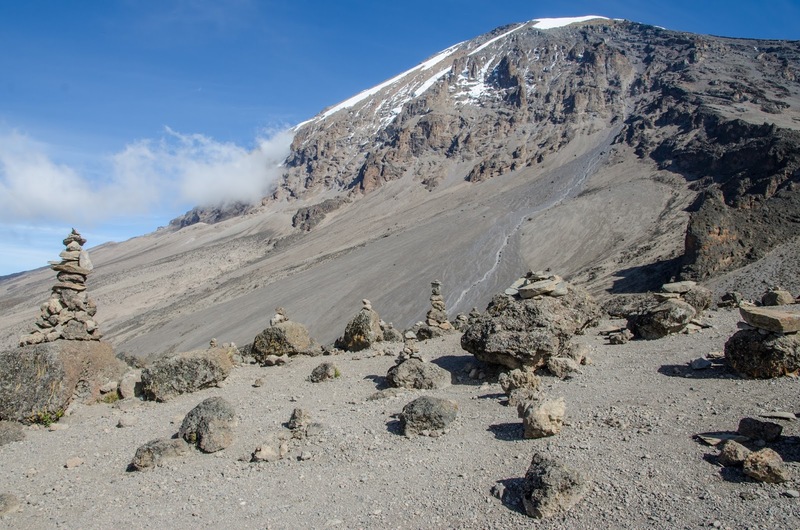 I’m still not sure why this area and the cairns were so special but it certainly was neat to walk through with Kilimanjaro towering above us. 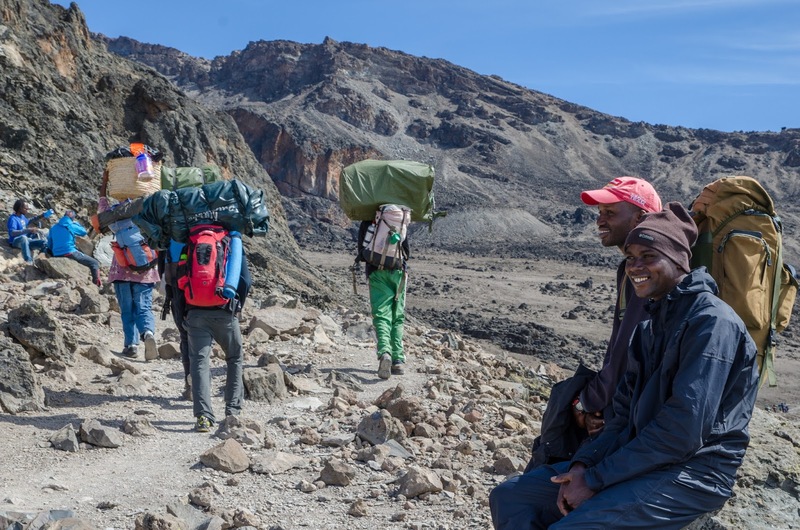 While we were stopped Mike and Emanuel were chatting with some of our porters who were passing us as usual. One of them stopped to chat with Mike so I took the opportunity to walk over and pull the stuff sack off his head and put it on mine to get the feel for what they must carry up the mountain for us I’d guess the stuff sack weighed about 20lbs and honestly it didn’t feel that terrible on my head, but of course I wasn’t walking the same distance and I had poles in my hand which he did not. Perhaps if I had grown up using the technique it would be different but there was no way on earth I’d be able to carry my bag on my head. 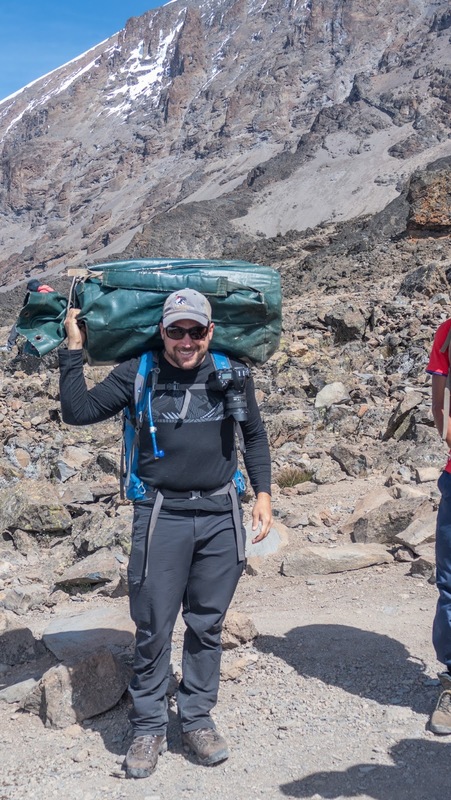 All of us seemed to be fairing decently with the altitude without major issues as we made our way up to the 15,000 ft basecamp but I was definitely fairing the worst with a non-stop headache. Eric and Emy had Diomox with them I could have taken but there was a small risk of getting sick and I didn’t want to blow my chance of the summit to cure a headache. 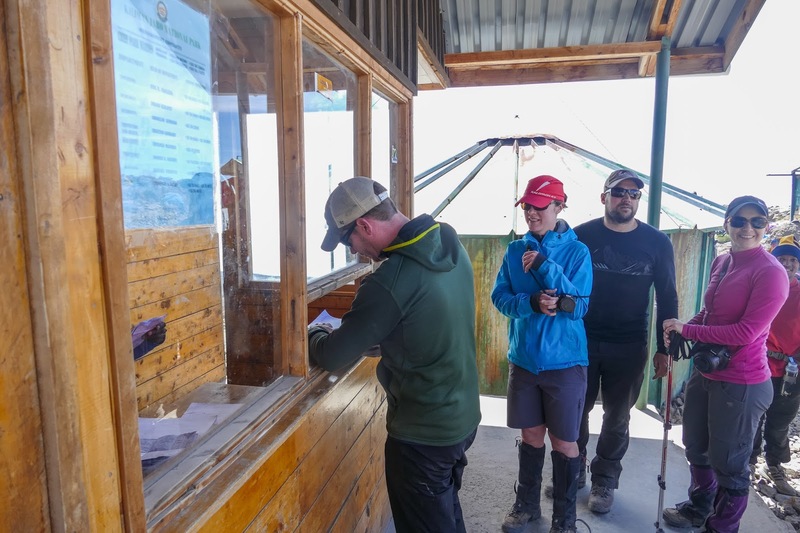 My readings of blood O2 and heart rate were the same as Eric’s and the guides didn’t seem worried about me. As long as I kept taking ibuprofen and aleve I seemed to be fine. I think it all may relate to how my body regulates water.. as in.. not well. I’ve always had extremely dry skin and even though I was drinking well over 120 oz of water a day with electrolyte tabs in it perhaps my liver was not delivering the water to my cells and head as needed. 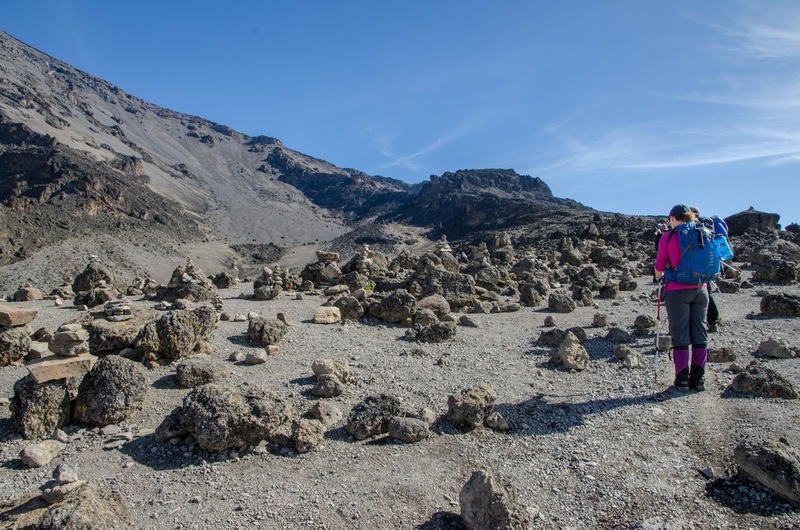 I’ve had plenty of dehydration headaches in the mountains and outdoors and that is exactly what these headaches felt like despite the amount I was consuming. Perhaps also I was taking too many electrolyte tabs and it was flushing the water too quickly from my system. Point is, I think my headaches were more H2O related than altitude as my mind and memory were solid and I could think very lucidly. I did decide though to stop taking the electrolyte tabs and to stop drinking tea and coffee on the hike to try to stay more hydrated. 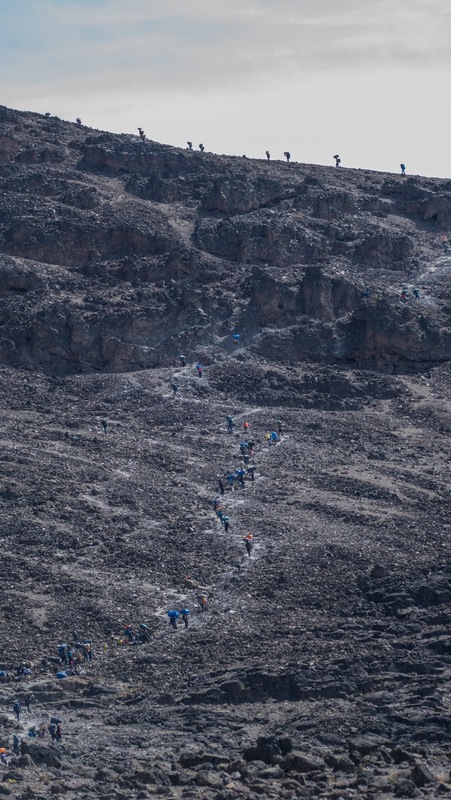 Yet again we had to traverse a “moonscape” of alpine environment and then ascend a steep wall to get up to Barafu Camp. This camp was huge! 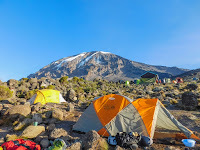 There were tents everywhere as other expeditions had come up the shorter Mweka camp and this served as the Basecamp for everyone on the mountain except for those crazies trying the Western Breach route from Lava Tower. 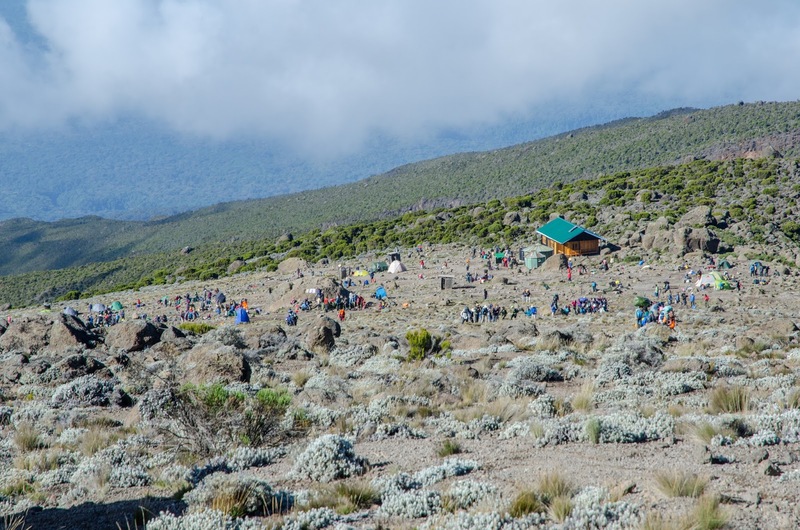 Our porters had set up our tents far below the mass of people at the site so we had to walk up a ways to be able to sign in at the camp. 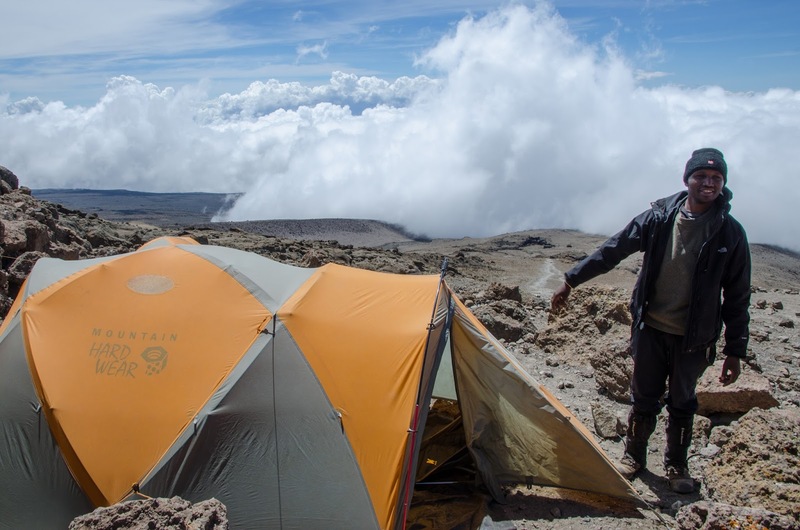 Since we got to camp at 11am we had literally the entire day to relax but this proved harder than usual as we were set up behind a wind wall directly in the sun… which at that altitude above any clouds, was incredibly hot! Em and I crawled into our tent but couldn’t stay in it long as some of the key ventilation zippers were jammed and we couldn’t get enough of a breeze through to stay cool. 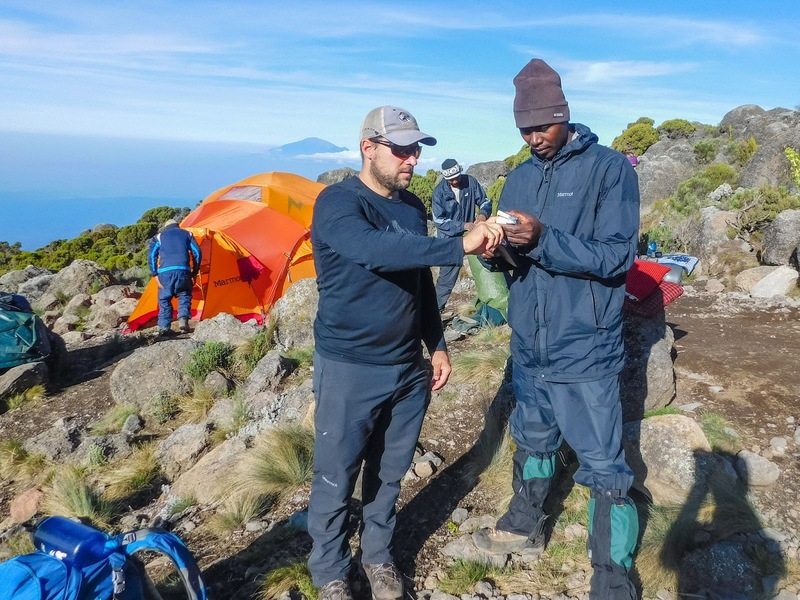 15,000 feet on Kilimanjaro and we were roasting! 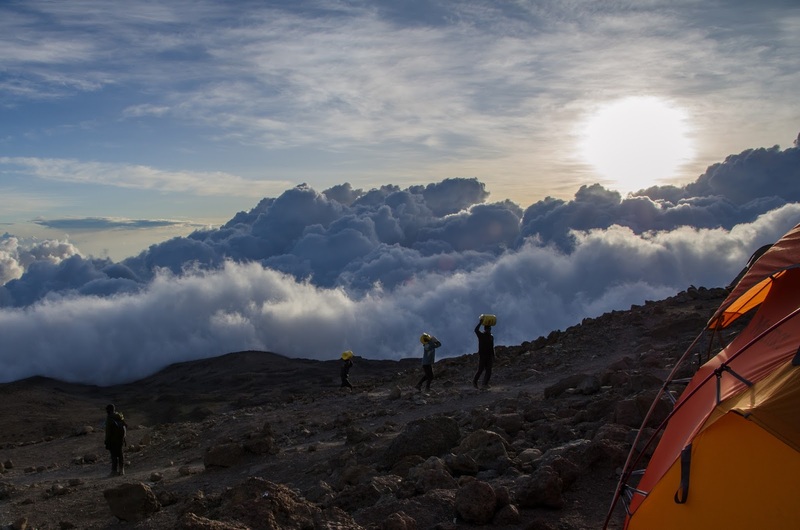 So, I took the afternoon to walk around the camp and take a lot of photos and time lapses of the beautiful clouds moving past the mountain below us. 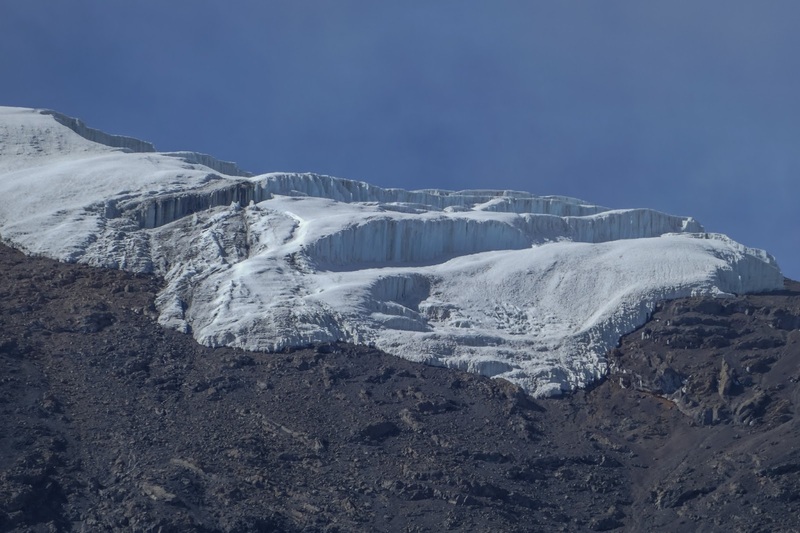 We also got our first glimpses of the jagged Mawenzi peak on the side of Kilimanjaro which very few people climbed because of its difficulty. Around 1:30pm were were served a hot lunch of pasta and roasted chicken which was delicious. After eating I popped some more Aleve to calm my head and spent the afternoon in the cooler LAIR mess tent trying to stay cool out of the hot sun beating down on us. I watched a couple movies in the tent and Humphrey even joined me for a little while watching one. 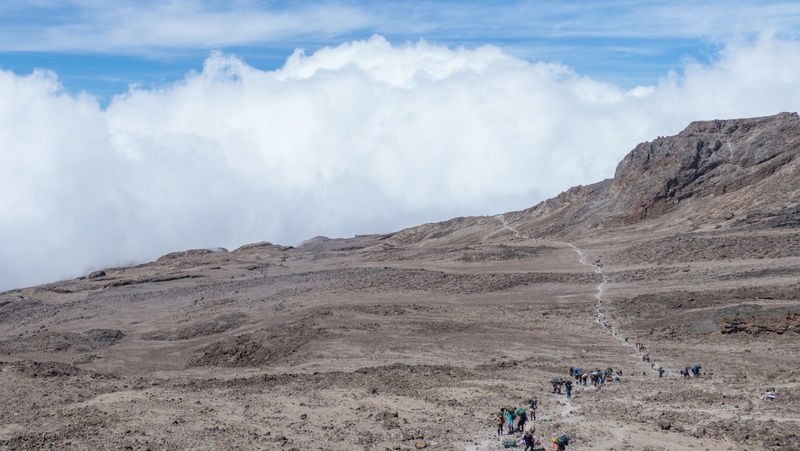 It wasn’t until around 3:30pm that the clouds started to encroach the summit but even then it was short-lived and they fell back down below us. Sunset from Barafu was beautiful. 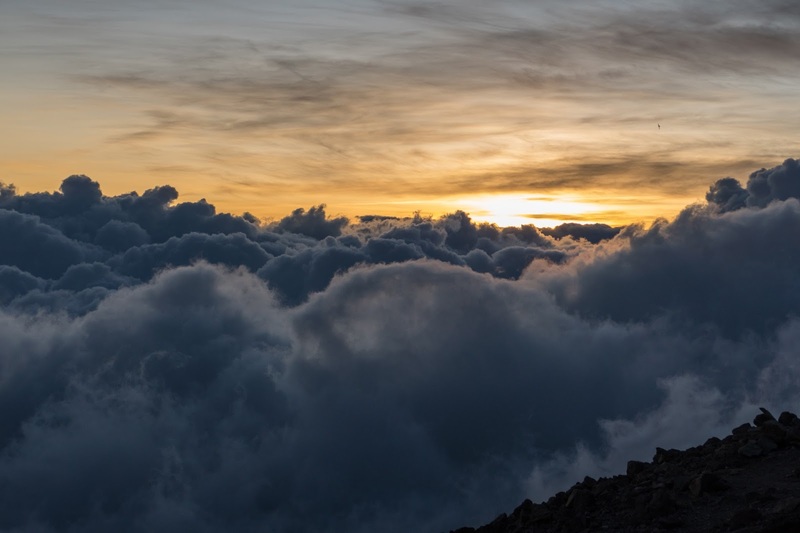 The clouds screaming by below us combined with the setting sun lit up the horizon and it was really something to see. I grabbed a lot of photos as well as some sweet panning time-lapse of the beautiful display. 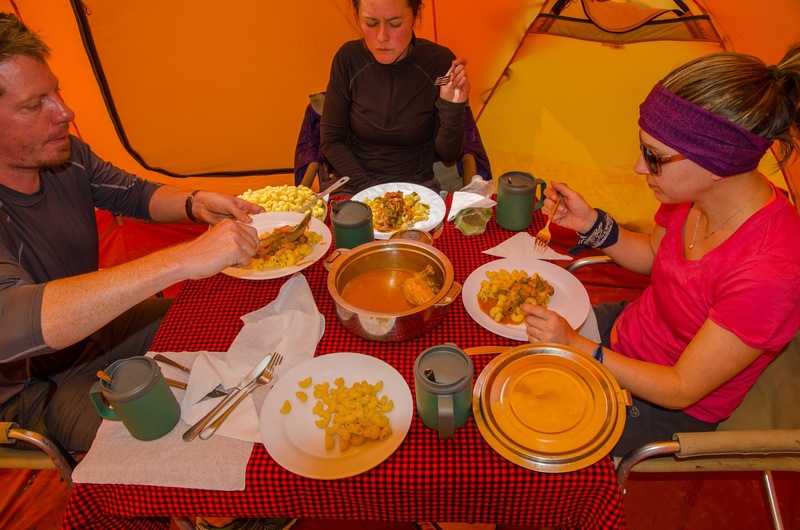 For dinner we had pasta with meat and bread (loading us up on carbs clearly) and we all hit our tents around 7:15 to get 4 hours of sleep before our huge summit day. 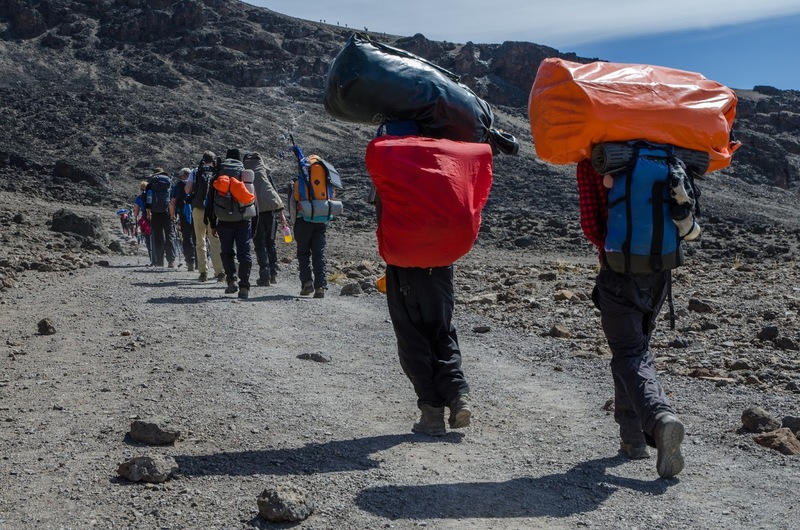 We would be getting up at 11pm to gear up and leave by midnight. 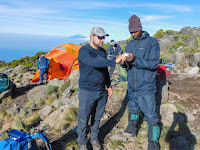 This was an hour later than planned because Mike and Emanuel said we were making great time and it would still hit the summit by sunrise. Because I hadn’t stayed up late the nights before I had fingers crossed I would wake up to clear skies and a full moon for our summit day!